Fall officially arrives this week, and with it comes the dazzling fall foliage. Burnt oranges, vibrant yellows, deep reds, purples, and brilliant golds are slowly starting to creep across the landscape as peak leaf peeping season approaches. If you live for colorful fall foliage, you are probably planning out your yearly scenic drive, camping trip, or adventure. Looking for a new place to embrace the changing scenery? Here are 7 destinations in America that boast amazing best fall colors. The already stunning scenery of this park becomes even more spectacular during the fall. Whether you choose to experience the changing colors by hike, bike, or car, you won’t be disappointed in this fabulous landscape. Peak leaf peeping varies depending on elevation. 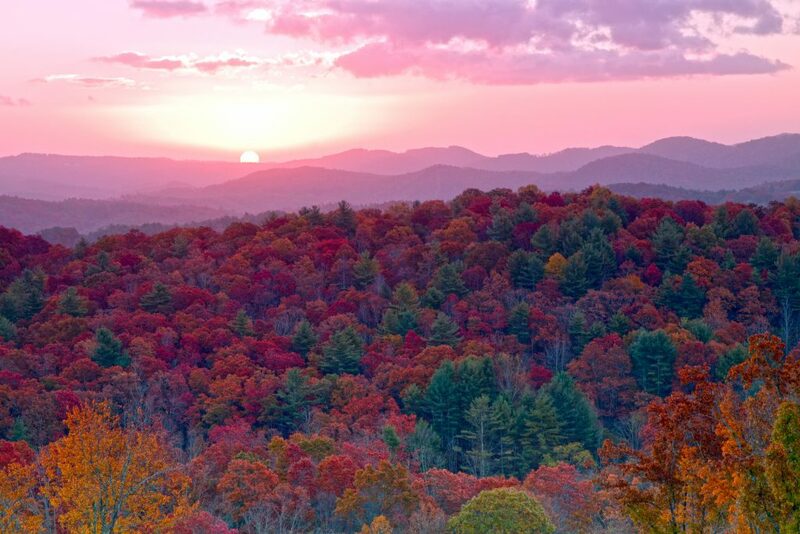 At higher elevations, the foliage is at it’s most vibrant mid-to-late October. For the best views, drive Clingmans Dome Road or the Blue Ridge Parkway. Michigan’s Upper Peninsula boasts more than 7 million acres of forests, gorgeous inland lakes, beautiful shorelines of 3 Great Lakes, and thundering waterfalls. 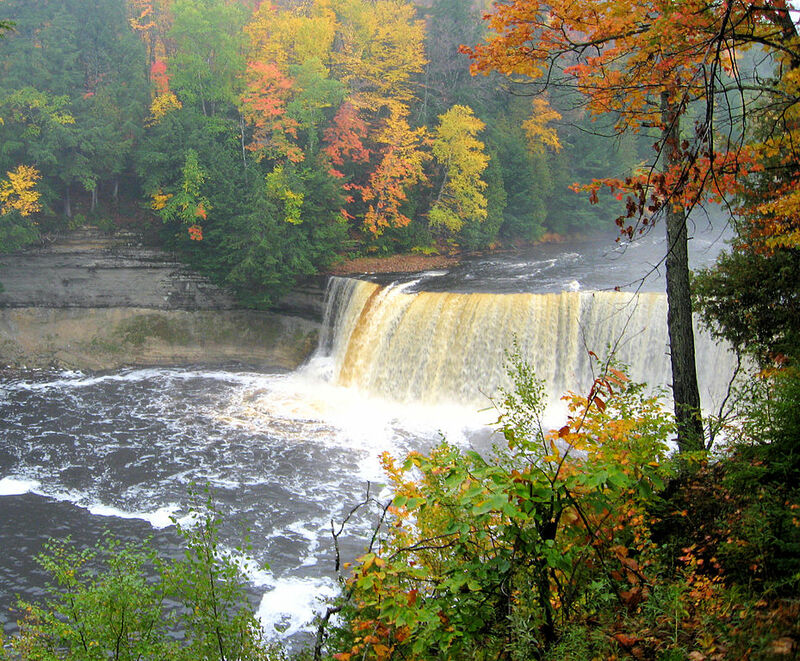 Take in the brilliant reds, yellows, and oranges at Porcupine Mountains State Park, Tahquamenon Falls State Park, or Mackinac Island. If you want to see the most brilliant colors, visit during the last week of September or the first week in October. Aspen is a fall paradise. Moderate temperatures create the perfect environment for outdoor recreation like hiking, biking, fly fishing, and golf. Like the city, the aspen tree comes to live and shows off its stunning golden hues. 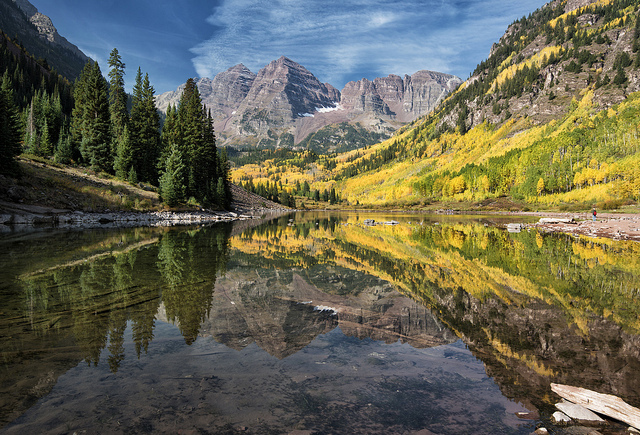 Visit the Maroon Bells, Cathedral Lake, or one of the many scenic roads to marvel at the magical landscape. The ideal time to do some leaf peeping in Aspen is the third and fourth week in September. 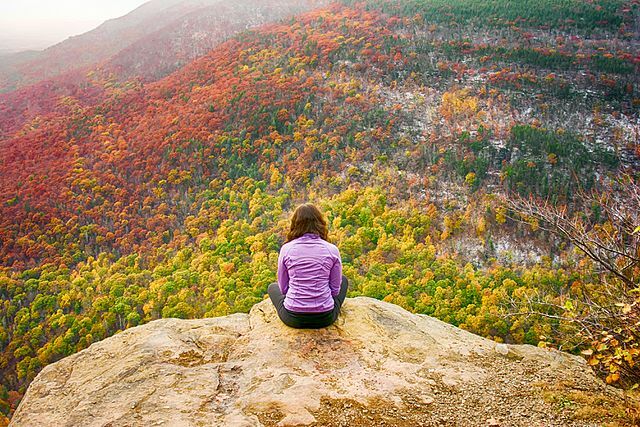 New York is well-known for its fabulous fall foliage, and the Catskill are arguably one of the best places to get outdoors and enjoy the changing landscape. Whether you prefer to take a hike, hop in a canoe, relax on the Catskill Mountain Railroad, or sit back on a scenic drive, you will fall in love with the vibrant colors at this destination. Plan your visit for the first or second week in October for the ultimate leaf peeping experience. 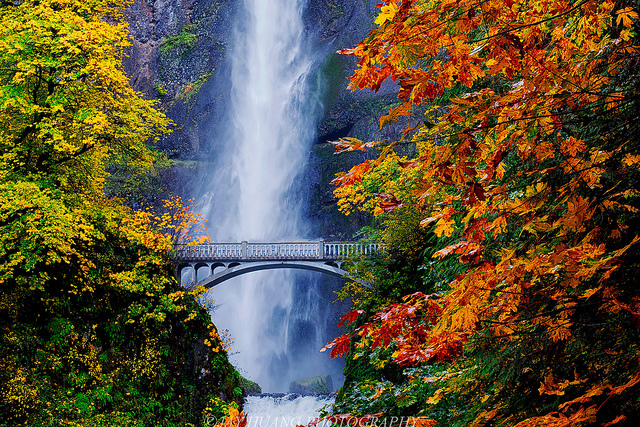 Popular for its breathtaking waterfalls, the Columbia River Gorge becomes even more enchanting during the fall season. There are a number of great hikes that will allow you to get up close and personal with the gorgeous fall scenery. In addition, there are a few spectacular drives, like the Historic Columbia River Highway Scenic Byway, that are a must-do. Due to the great variation in elevation, it’s hard to pinpoint an exact “best time” to check out the fall foliage, but mid-October should provide a beautiful show. Image: Nancy <I’m gonna SNAP! Located in central Missouri, this area offers prime leaf peeping opportunities. Between the rolling hills, lovely temperatures, and vibrant forests, you won’t ever want to leave this destination. Hiking, biking, and horseback riding are all popular activities at Lake of the Ozarks State Park. If you want to relax, stop by a local winery, play a round of golf, or sit back and take in the beautiful colors from the water. 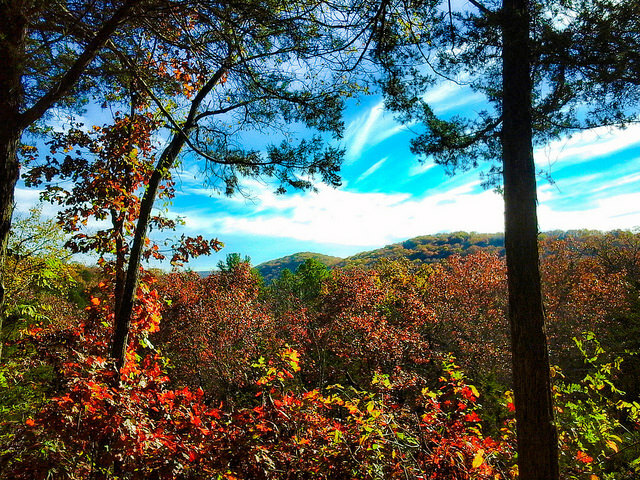 Late October through early November are generally the best times to enjoy fall in the Ozarks. During the month of October, Shenandoah National Park explodes with brilliant colors. The park staff give great weekly updates, complete with photos, throughout the month so if you’re planning a trip, check out the leaf status! 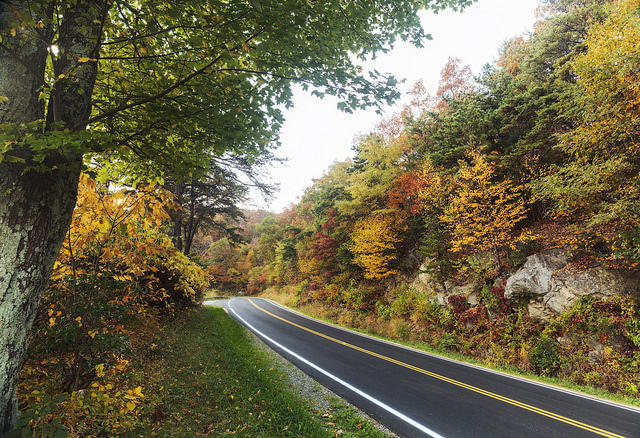 The 105-mile Skyline Drive Scenic Highway is extremely popular for viewing the vibrant landscape. If you feel like enjoying the fall weather, take a hike to Dark Hollow Falls or challenge yourself with the Old Rag Loop. Looking for more places to explore? Check out Camping Adventures or find your perfect outdoor accommodations on CampNative.com!